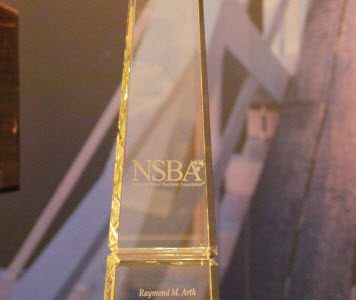 On June 19, NSBA honored five exceptional small-business owners for the 2017 Lewis Shattuck Small Business Advocate of the Year Award. The award honors small-business owners who go above and beyond in advocating for policies to improve America’s small-business community. NSBA today honored the overall award winner, David Ickert, along with four finalists. NSBA Board Chair Pedro Alfonso recognized David Ickert of Air Tractor, Inc. in Olney, Texas as the 2017 Small Business Advocate of the Year. Ickert has testified numerous times before the House and Senate, spoke at several roundtables for Congressional staff, met with President Barack Obama on key export issues, and has authored numerous editorials in local, regional and national publications. He been an invaluable resource for NSBA and has raised the importance of small-business exporting to new levels. Because of Ickert’s tireless efforts, small-business exporters for years to come will have access to export finance they otherwise wouldn’t have. Alfonso also recognized the four finalists for the award, first honoring Curtis Richardson of C&J Electrical Services, LLC in Birmingham, Alabama. Richardson has been a tireless advocate on behalf of small businesses throughout the state of Alabama. He is President of the Birmingham Metro Black Chamber of Commerce and was appointed by Governor Robert Bentley to serve two terms on the Alabama Small Business Commission. Richardson has worked on key pieces of legislation to address small-business apprenticeships and was recognized by the Initiative for a Competitive Inner City for his work to help position inner-city small businesses for growth and success. Next, Deborah Rutledge of Rutledge Group, Inc. in Cleveland, Ohio was recognized as a finalist. Rutledge is deeply engaged in small-business groups and several charity efforts. She serves on the boards of COSE in Cleveland and NSBA, and has participated in numerous legislative visits for both organizations. Rutledge has lobbied lawmakers in Ohio and Washington D.C. on a wide range of topics including small business, workforce development and cancer research. The next finalist recognized was Michael Stanek of Hunt Imaging, LLC and Cleveland Cycle Tours, who is an active and extremely insightful representative for small business. Stanek has served as a city councilman in three different communities covering more than 13 years and chaired the Advocacy Committee for COSE for three years. He has testified before the House Small Business Committee on international trade and was recently appointed by Ohio Governor John Kasich as the sole representative of employers to Ohio’s Medical Marijuana Advisory Committee. Alfonso then recognized Diane Sumpter, president and CEO of DESA, Inc. in Columbia, South Carolina. Sumpter has spent more than four decades volunteering for entrepreneurial causes and working to promote small, women and minority businesses. She meets regularly with her bipartisan lawmakers, has received accolades from officials on various levels, including Governor Nikki Haley and President Bill Clinton, and was recognized in an official resolution of the South Carolina Senate. Sumpter has greatly contributed to small-business success in South Carolina and beyond. The Small Business Advocate Award luncheon was the kick-off event to the 2017 Washington Presentation. Please stay tuned for more details.